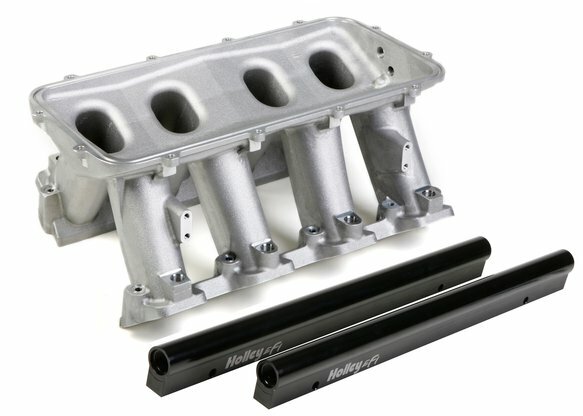 The Holley GM LS1/LS2/LS6 Modular Hi–Ram Intake Manifold is introduced as a cost effective alternative to fabricated sheet–metal for high–performance applications where induction system height is not limited. Coupling this Hi–Ram intake with the high flowing LS1/LS2/LS6 style cylinder heads has outstanding potential for N/A and forced induction applications at a budget–minded cost. Aggressive, bold, race–bred styling will make bad intentions clear for drag race, muscle car, marine, off–road, sandrails, pulling trucks, track, street–rod applications and more! • The base is designed to be modular in configuration to accept a wide range of carbureted and EFI tops and to be attractive to builders and fabricators as the foundation for custom induction systems. • Runner length and the tapered cross–section designed to perform well for a wide range of engine configurations • EFI fuel rails are machined for –8AN O–ring Fittings with passages large enough to accommodate high fuel flows and dampen pressure pulsations in the fuel system and come standard with EFI Hi–Ram kits. • Cast aluminum construction. • Intended for use on N/A or forced induction engines in the 6.0 to 7.0+ liter range, max power at 7000–8000+RPM.